The coating thickness gauges by ElektroPhysik from the MiniTest 700 series rank among the most accurate and versatile coating thickness measuring devices. The radio sensor SmarTest is 16 mm / 0.63" in diameter and 125 mm / 4.92" in length somewhat like a thick ballpoint pen and weighs just 48 g / 1.7 oz. This means that you can carry the SmarTest with you anywhere. 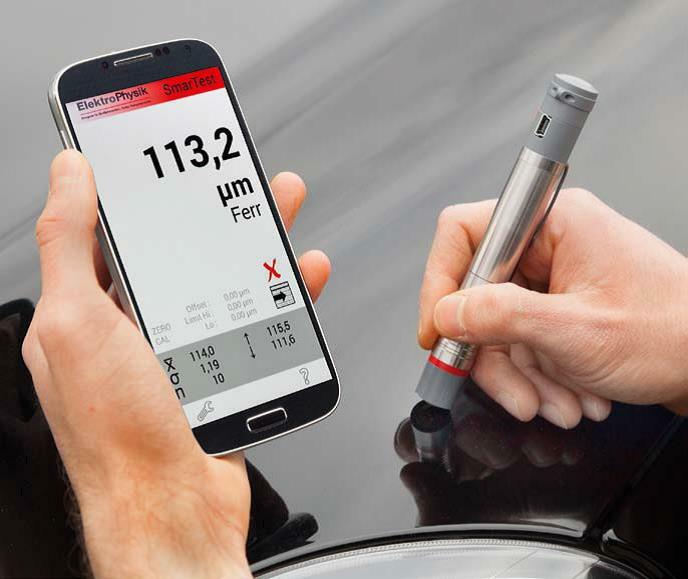 The standard scope of supply comes with the F 2.6 or FN 2.6 sensor, which has been specially optimised for measuring on thin auto body sheets and can be used for a sheet thickness downwards of 0.3 mm / 12 mils. You can connect any SIDSP sensor to SmarTest and cover a wide range of coating thickness measurement tasks.